My wife's mother Joan died. Only a few months before, we had wandered around the churchyard at Long Melford visiting the graves of Joan's parents and brothers, but she fell ill suddenly in October, and at the start of November she died peacefully in her sleep. It was All Saints Day. 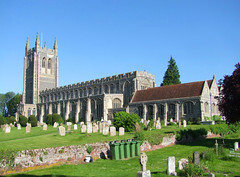 It was more than half a century since she had been married in Long Melford church, and more than forty since her daughter Jacqueline was baptised there. This was the family church, and that made it special in a particular way, but Holy Trinity is a special place in lots of ways, of course. 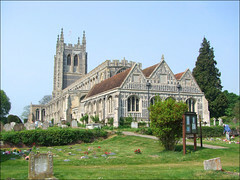 Easily the grandest church in Suffolk, more feminine and beautiful than its near rival Lavenham, it was the only church in Suffolk to receive five stars in Simon Jenkins' sometimes controversial England's Thousand Best Churches. Ignoring the most un-Suffolk-like 20th Century tower, the vast nave with its aisles and clerestories is the crowning moment of East Anglian Perpendicular, with which only Salle in Norfolk can compete. In 1960, when Joan had married here, Long Melford was still an industrial village with an ironworks and other factories, but all that is gone now. It is hard to see beyond a pleasant picture postcard village, with its antique shops along the long High Street which stretches southwards from the village green all the way to Sudbury. The graves that sprawl eastwards of the church are a reminder that ordinary lives are led even in a place like this. The setting of Holy Trinity is superlative. At the highest point and square onto the vast village green, its southern elevation is punctuated by the 16th Century Trinity Hospital almshouses. Across the green is the prospect of Melford Hall's pepperpot turrets and chimneys behind a long Tudor wall. Another great house, Kentwell Hall, is to the north. Kentwell was home to the Clopton family, whose name you meet again and again inside the church. 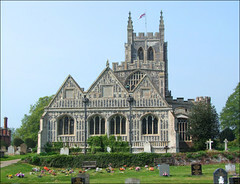 Norman Scarfe described it as in a way, a vast memorial chapel to the family. Holy Trinity is the longest church in Suffolk, longer even than Mildenhall, but this is because of a feature unique in the county, a large lady chapel separate from the rest of the church beyond the east end of the chancel. The chapel itself is bigger than many East Anglian churches, although it appears externally rather domestic with its triple gable at the east end. There is a good collection of medieval glass in the otherwise clear windows, as well as a couple of modern pieces, and a very mdern altarpiece at the central altar. Jacqueline's mother remembered attending Sunday School in this chapel in the 1940s. The intimacy of the Lady Chapel is in great contrast to the vast walls of glass which stretch away westwards, the huge perpendicular windows of the nave aisles and clerestories, which appear to make the castellated nave roof float in air. An inscription in the clerestory records the date at which the building was completed as 1496. Forty years later, it would all have been much more serious. Sixty years later, it would not have been built at all. A brick tower was added in the early 18th Century, and the present tower, by GF Bodley, was encased around it in 1903. As Sam Mortlock observes, this tower might seem out of place in Suffolk, but it nevertheless matches the scale and character of the building. It is hard to imagine the church without it. I came here back in May with my friend David Striker, who, despite living thousands of miles away in Colorado, has nearly completed his ambition to visit every medieval church in Norfolk and Suffolk. This was his first visit to Long Melford, mine only the latest of many. We stepped down into the vast, serious space.. There was a fairly considerable 19th Century restoration here, as witnessed by the vast sprawl of Minton tiles on the floor, although perhaps the sanctuary furnishings are the building's great weakness. Perhaps it is the knowledge of this that fails to turn my head eastwards, but instead draws me across to the north aisle for the best collection of medieval glass in Suffolk. During the 19th century restoration it was collected into the east window and north and south aisles, but in the 1960s it was all recollected here. Even on a sunny day it is a perfect setting for exploring it. The most striking figures are probably those of the medieval donors, who originally would have been set prayerfully at the base of windows of devotional subjects. Famously, the portrait of Elizabeth, Duchess of Norfolk is said to have provided the inspiration for John Tenneil's Duchess in his illustrations to Lewis Carroll's Alice in Wonderland, although I'm not sure there is any evidence for this. Indeed, several of the ladies here might have provided similar inspiration. The best glass is the pieta, Mary holding the body of Christ the Man of Sorrows. 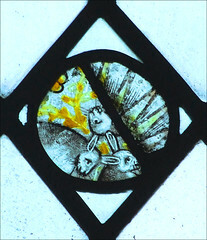 Beneath it is perhaps the best-known, the Holy Trinity represented in a roundel as three hares with their ears interlocking. An angel holding a Holy Trinity shield in an upper light recalls the same thing at Salle. Other glass includes a fine resurrection scene and a sequence of 15th Century Saints. There is also a small amount of continental glass collected in later centuries, including a most curious oval lozenge of St Francis receiving the stigmata. Walking eastwards down the north aisle until the glass runs out, you are rewarded by a remarkable survival, a 14th century alabaster panel of the Adoration of the Magi. It probably formed part of the altar piece here, and was rediscovered hidden under the floorboards in the 18th century. Fragments of similar reliefs survive elsewhere in East Anglia, but none in such perfect condition. Beyond it, you step through into the north chancel chapel where there are a number of Clopton brasses, impressive but not in terribly good condition, and then beyond that into the secretive Clopton chantry. This beautiful little chapel probably dates from the completion of the church in the last decade of the 15th century. Here, chantry priests would have celebrated Masses for the dead of the Clopton family. The chapel is intricately decorated with devotional symbols and vinework, as well as poems attributed to John Lidgate. The beautiful Tudor tracery of the window is filled with elegant clear glass except for another great survival, a lily crucifix. This representation occurs just once more in Suffolk, on the font at Great Glemham. The panel is probably a later addition here from elsewhere in the church, but it is still haunting to think of the Chantry priests kneeling towards the window as they asked for intercessions for the souls of the Clopton dead. It was intended that the prayers of the priests would sustain the Cloptons in perpetuity, but in fact it would last barely half a century before the Reformation outlawed such practices. You step back into the chancel to be confronted by the imposing stone reredos. Its towering heaviness is out of sympathy with the lightness and simplicity of the Perpendicular windows, and it predates Bodley's restoration. The screen which separates the chancel from the south chapel is medeival, albeit restored, and I was struck by a fierce little dragon, although photographing it into the strong south window sunshine beyond proved impossible. The brasses in the south chapel are good, and in better condition. They are to members of the Martyn family. The south chapel is also the last resting place of Long Melford's other great family, the Cordells. Sir William Cordell's tomb dominates the space. He died in 1581, and donated the Trinity Hospital outside. His name survives elsewhere in Long Melford: my wife's mother grew up on Cordell Road, part of a council estate cunningly hidden from the High Street by its buildings on the east side. At the west end of the aisle is the towering 1930s cover to the medieval font where her daughter would be baptised. 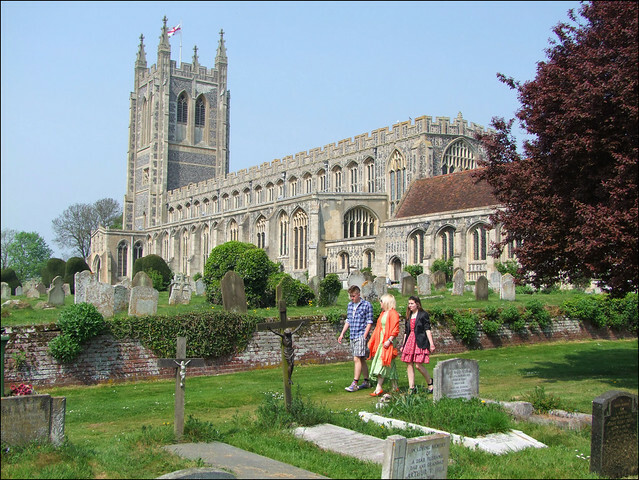 Before she died, Joan asked that she should not be buried among the family graves at Long Melford, because they were too far from home, and she thought it would make it difficult for her husband to visit her there. If I tell you that Joan and Bob lived off the Melford Road in Sudbury, barely three miles from the church, and in any case Bob is a perfectly capable car driver, it might give you an insight into how parochial working class Suffolk still was in the early years of the 21st century. Instead, she chose to be buried in Sudbury, within walking distance of the family home. But anyone who knew her well would tell you that she was really a Melford girl at heart.